A busy day here, so a brief post on a miner’s description of a token of death found in his lantern flame. Miners were often thought to be as superstitious as sailors, who were a notoriously nervous lot. Miners monitored their lamps carefully–a guttering or blue flame could signal blackdamp or some other invisible, yet earthly, threat. This miner, however, suggested that the surprisingly agile flame of his lamp had a more sinister purpose: singling out a man soon to die. 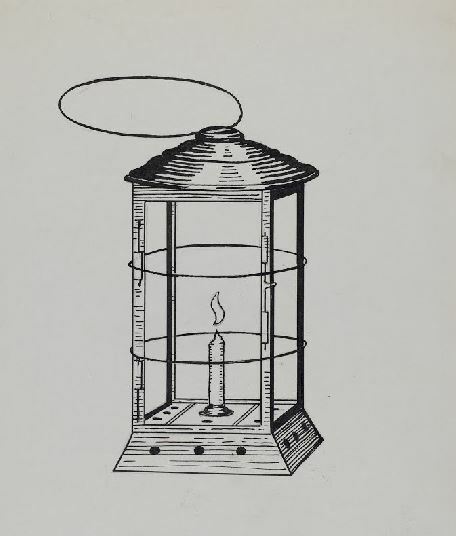 A Lantern’s Flame as a Warning of Death. The Virginia (Nevada ) Chronicle says: There are wonderful things to be studied in the vast laboratory where nature has stored her treasures. The men who toil in the caverns of the ground and tread the endless windings of the drifts have their presentiments of coming calamity, and at times feel the touch of death in the very air. A Chronicle reporter was talking with an old miner a few days ago who implicitly believed that no death ever took place in the mines without a warning of some kind. “You see,” he said, “death never comes of a sudden upon the men in the mines. You reporters write up accidents and tell how something gave way or fell quick and killed somebody. Now, this ain’t so. There’s always some warning. When I see my lantern begin to burn low down and blue, I know that there is danger ahead. If it keeps on for days and then begins to waver and flicker, I’ll watch it close to see where it points. Now, you may set me up for a fool, but what I’m tellin’ is the gospel truth. When the flame leans over (as if it was being worked by a blowpipe) and points to a man, death has marked him. Some years ago, when Bill Hendricks was killed in the Savage, the flame of my lantern pointed right to him for over an hour, and when he moved the flame would turn, just as if Bill was a loadstone and the flame was a mariner’s needle. I knew he was gone, and told him to be careful about the blast. Well, he got through that all right, and got on the cage. As we went up the candle kept acting strangely, and at times the flame would stretch out long and thin towards Bill. At length it gave a sudden flicker, and Bill reeled to one side and was caught in the timbers. I heard his dreadful cry as he disappeared down the shaft, and while he was bounding from side to side, dashing out his brains and scattering his flesh down to the bottom, my light went out. I never lit that lantern again. It hangs up in my cabin now, and it always will. There’s more in a candle-flame than people think. I’d rather see a cocked revolver pointed at me than a candle-flame; a revolver sometimes misses, but a candle-flame is sure to kill when it starts towards a man. I must start for my shift now. Don’t give my name to anybody. There are some who would laugh at me.” The man then picked up his bucket and walked away. While I’ve written before about spook lights and other tokens of death, this directional flame is new to me. The closest I can come are corpse candles, which float into the cottage of the soon-to-be-corpse or drift along a victim’s last route. Other examples?